2018 Update: Organic Click-Through Rates - Search Visibility | Jody Nimetz Co. Being in the Search business for nearly twenty years means seeing trends come and go and seeing changes in how the search engines serve up results. One thing that has changed over the years is the amount of click activity that happens on a Search Engines Results Page (SERP). There are a number of reason for the change in click activity but the main cause is obviously the changing dynamic of the search results that appear on SERP. Over the years, I’ve written a number of posts on organic click activity and wanted to share some of my previous thoughts on organic click-through rates (CTRs). Before we get into some of he retro commentary, I think it is important to define what exactly organic click through rate (OCTR) is. Organic click-through rate is basically a simple formula that calculates the percentage of clicks that a natural (organic) search result gets by users for a given keyword query. In essence, it is the number of clicks a search result receives, divided by the number of times it’s viewed on the SERP (known as an impression). It is an indicator of visibility on a Search Engine Results Page. There have been a number of studies and research done on organic click through rates. 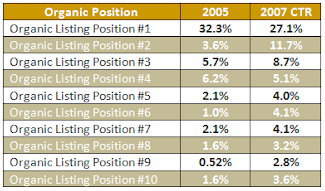 In fact, back in the day, we at Enquiro, did some of the earliest research on click-through rates specifically on organic click through rates (see below for some of those findings). A couple of things worth noting is that click-through rates can vary depending on the nature of the search query but one thing hasn’t changed, the higher you rank in search the higher the organic click through rate will be. When it comes to intent, often, the longer the search query, the stronger the intent and potentially further along the buying cycle, the higher the click-through. I was part of the team at Enquiro that released groundbreaking research in this area over a decade ago. Where and what people click on has always been fascinating to me. Even more interesting is the fact that traditionally Searchers click on organic results the majority of the time. Still around 80% of the time. However with Google continuing to exploit their search results pages with more ads, knowledge graph results, ever changing local packs and more, the organic real estate on a SERP (Search Engine Results Page) continues to change. 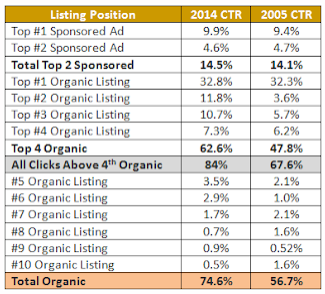 It stands to reason then that the organic click through rates are also changing. The article is reproduced in it’s entirety here sans some of the images. Getting back to desktop search, our most recent research from August 2014, suggests that the top five organic results account for approximately 65% of the clicks. 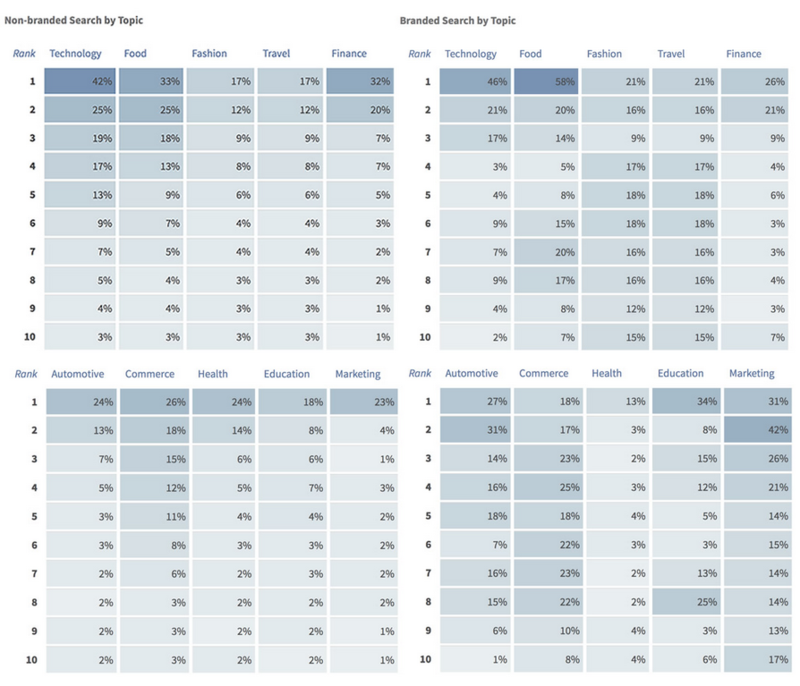 So the findings from Advanced Web Ranking and our own research are quite close. In fact, as taken from our own research here is the breakdown of the click data and how it’s distributed across the different elements of the SERP. Impressions are one thing, but organic click-through rates and actual organic clicks are what we are after. We are looking to drive traffic to our website which at the heart of it our websites are nothing more than a glorified brochure or guide for our business. It’s what we do with our messaging and the clicks that we do get which can have the greatest impact on our bottom line. Are you in it to win it, or are you in it to simply be an also ran and a potential rung on the ladder? People still click on organic listings regardless of desktop or mobile search, but it is all about convenience and being located in the prime real estate of a Google search is still where you want to be. The ever changing results pages, increased Web results competition and Google’s use of machine learning (see: RankBrain) can make it difficult to achieve this visibility. It does not come easy. You have to work at it. You need to ensure that your content marketing efforts are speaking to the needs of your targeted audience. Your site still needs to be sticky, that is your content needs to be highly engaging and probably most important for mobile is that your site and your content has to provide answers to what searchers are looking for. From an International perspective, the CTRs are actually a little higher coming in at 36% for desktop and 28% for mobile (based on a number one ranking in Google). So as you can see lots of great data on click-through rates, specifically organic click-through rates. Why are click-through rates important? Well for one organic search (or SEO as some people might refer to it) is all about visibility and gaining visibility within search engines results… specifically in Google. Understanding click-through rates helps illustrate the importance of optimizing your web properties for both desktop and mobile to ensure that your website has visibility in the results. It is why things like title tags and meta descriptions still matter in your optimization efforts. We still need to entice people to click through to your web property or to your app or to your brand on a social network. Visibility and findability are even more important now than ever. So you can continue to drop massive amounts of budget on SEM and paid listings for some temporary, short-term results, but if you spend the time (and some funds) on optimizing for natural search (organic) you can see just how much click activity and traffic that your web properties can get. At JodyNimetz.com we offer various audits to help you analyze and optimize your web properties. 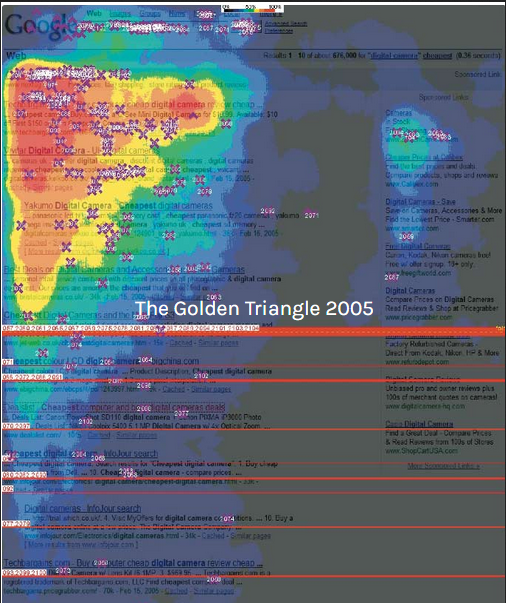 Why not improve your visibility in Search with some optimization techniques for your site? I’ve been specializing in brands gaining online visibility for nearly 20 years. Successfully I might add.